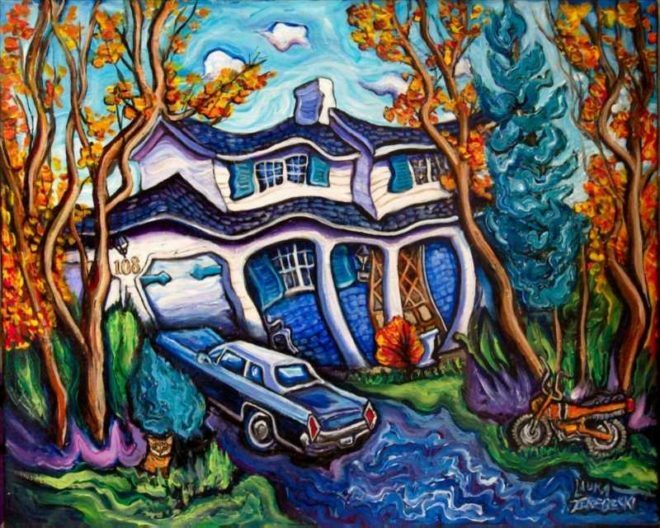 This painting was commissioned for parents who were downsizing to a smaller home at the end of 2007. The kids wanted to give them a portrait of the house they’d grown up in, a location that everyone referred to as “108”. 108 became the title and is kind of funny because it sounds like a deadly high fever temperature as well. Initially, they asked if I could do some portraits of the family members alongside; I demurred and said it’s unlikely I’d get portraits done in time for a Christmas gift (I know my own fiddly limitations), but how about a few representative items that symbolize each member of the family? They thought about it, and came back with three things that represented the whole family: the classic Pontiac Parisienne that acted as the main carriage for all the kid’s graduations and weddings, the dirt bike that everyone used to tear around the yard, and the family cat, a fluffy tortoiseshell cutie. It is charming that no one object was tied to a single family member: everything they came up with is something that the whole family enjoyed together, much like the house itself. That says something about the family, doesn’t it?